Disney’s first official iPhone park app is available now for free in the Apple App Store. It looks great, is easy to navigate, and is the first Disney parks app to show official wait times for attractions and — get this — augmented reality using geolocation and your iPhone camera (more on that later). 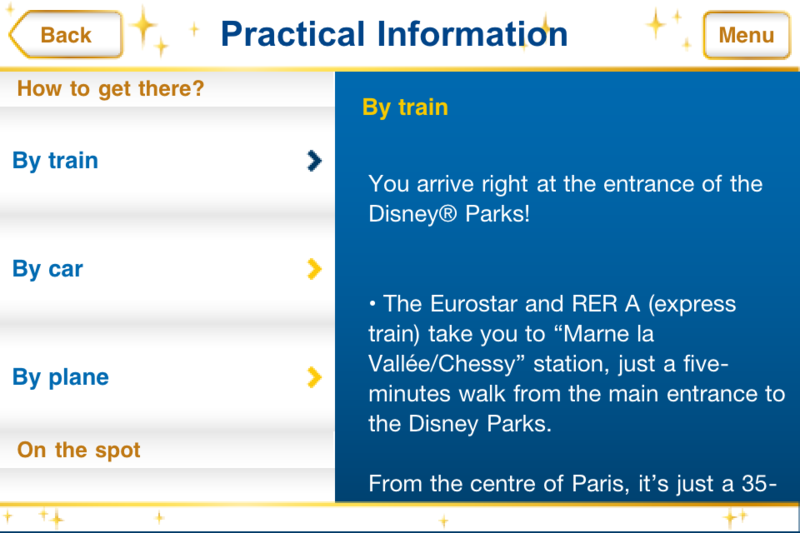 The only trouble with the app is . . .
. . . you have to be at Disneyland Paris to fully use it. 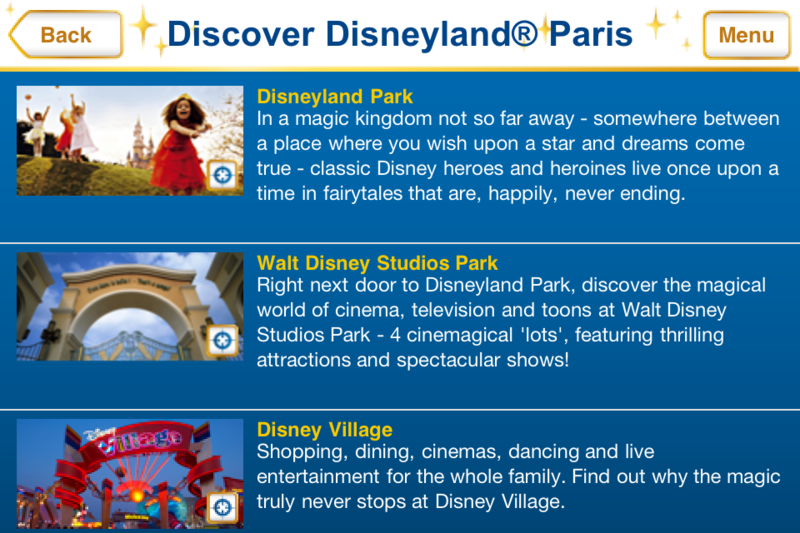 But even at home you can appreciate what a great app this is and see the Disneyland Paris Resort in a way that’s far better than reading a brochure or even the resort’s official website. 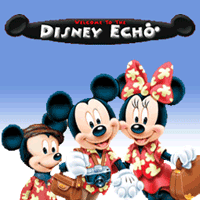 The app includes information about the resort’s two theme parks, Disney Village shopping and entertainment district, on-site resort hotels, restaurants, shops, parade/show schedules and maps of the entire resort. Inside the resort you’ll be kept up to date with daily showtimes and wait times for attractions. The Agenda section is great for planning your day before getting there as well as adding restaurant reservations, favorite attractions and so on to your itinerary as you’re on the go in the resort. 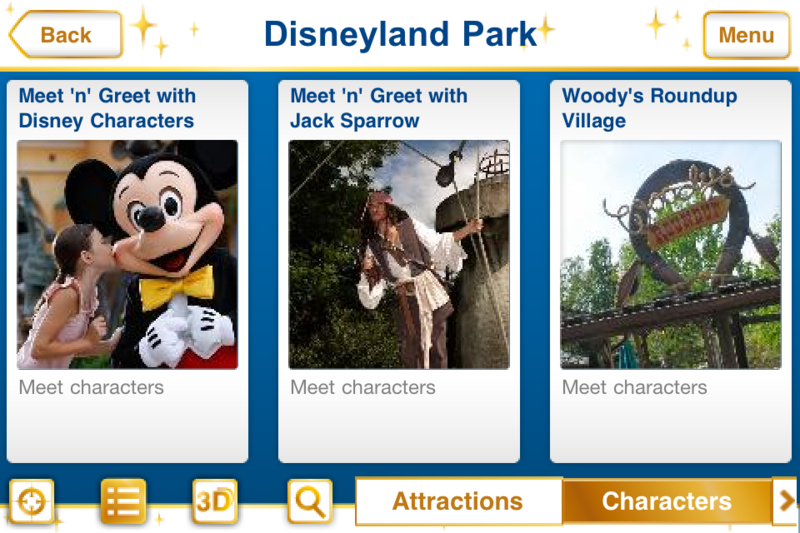 View live attraction wait times – Guests are able to check how long the queue is for any attraction in the park in real-time. Set alarms – remind yourself that a show is about to begin, for example. Use augmented reality maps – just point the iPhone’s camera at landmarks in the parks, which pops-up information on screen about the attraction you’re looking at. 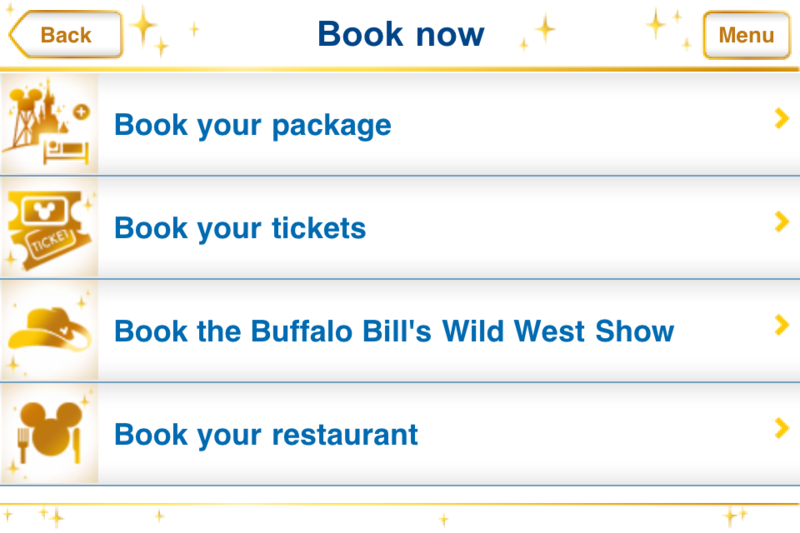 Search for attractions or restaurants – including the ability to filter rides by type or restaurants by price. 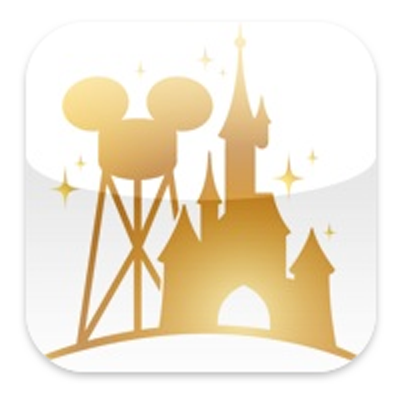 Okay, some other quibbles: While the app is compatible with iPhone, iPod touch and iPad if your device is running iOS 3.0 or later, to fully use the app you need 3G or Edge data while in the parks — which can be quite costly if you’re vacationing from the U.S. in the Disneyland Paris resort. 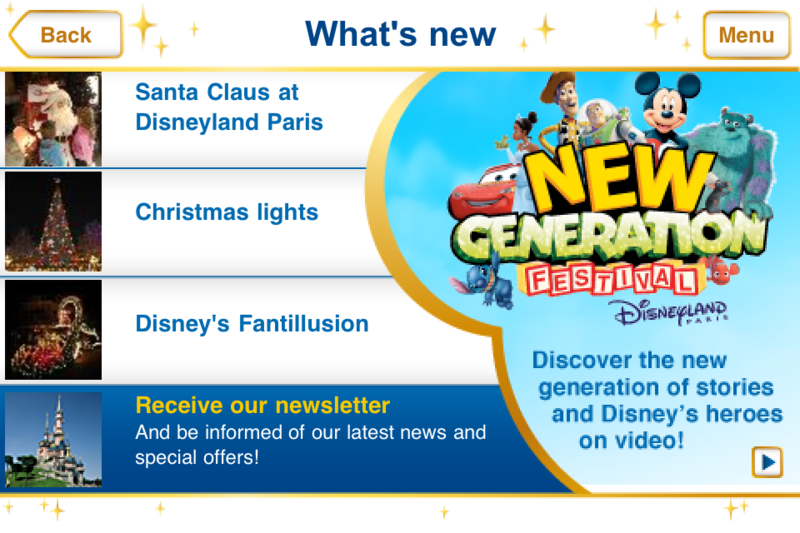 If you don’t have 3G or Edge (like on an iPod touch and some iPads) then live information isn’t available, like park opening hours, whether attractions and restaurants are open or not, etc. There is no free WiFi service available there. If you’re concerned about the expensive charges from using data from France’s Orange which will be billed to your AT&T account in the U.S., you can switch to Airplane Mode to save money. iPod touch users and Guests using an iPad without 3G or iPhone users worried about high data charges can switch data off and use the app without the live information. Another drawback is that the app only works in landscape mode, like a game. Also, while it can be used on the iPad, there isn’t an iPad-designed version of the app, so it will either be displayed with huge black borders around it or else pixel-doubling will need to be used. 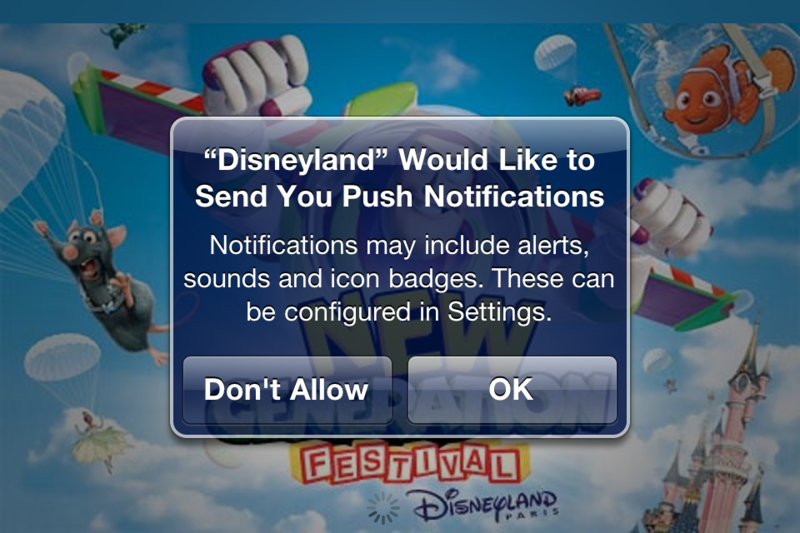 There’s no FastPass information/wait times in the app yet. 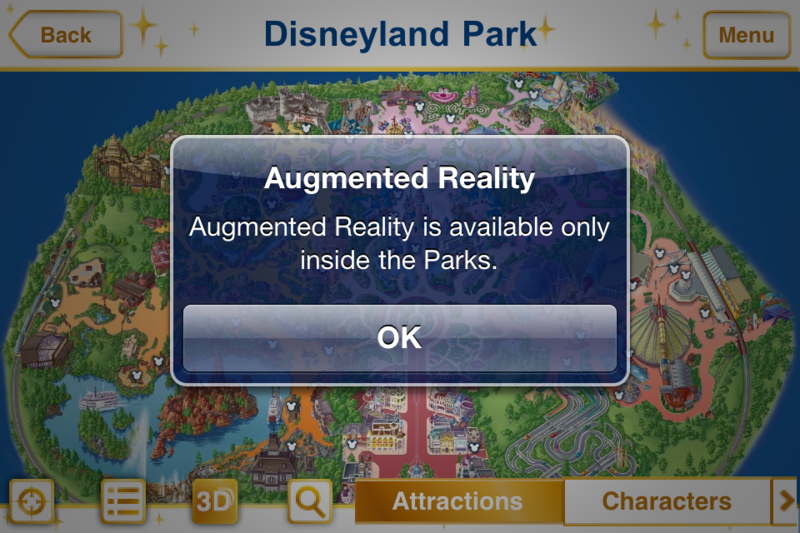 When in the parks using the app, press the “3D’ button to enter Augmented Reality mode then point your iPhone’s camera at landmarks and information about what you’re looking at will pop-up on screen. Cool, huh? 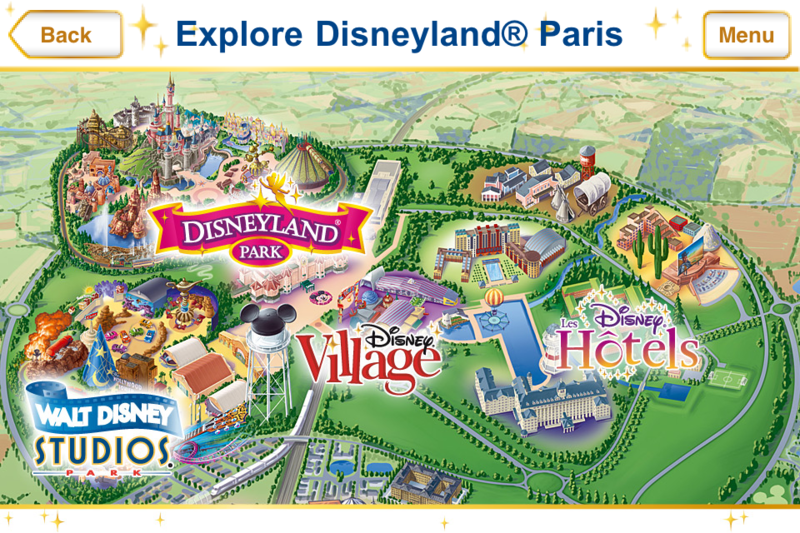 Discover Disneyland® Paris (its two parks, its hotels and Disney® Village), plan your stay, and once you are on site optimize your visit by using the interactive map, increased reality, the waiting time at the attractions and parade and show times that appear on your phone in real time. 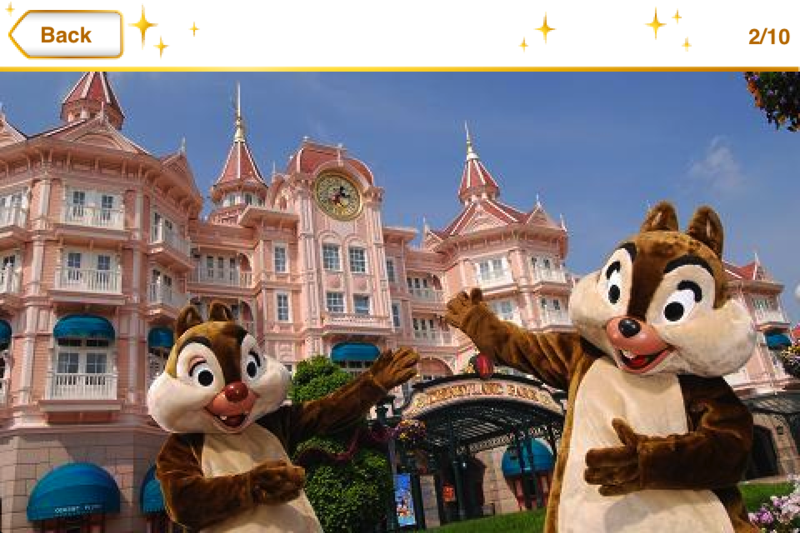 –	The presentation of our hotels, of our different park admission tickets and show tickets, with the possibility of reserving directly through our central reservations office. 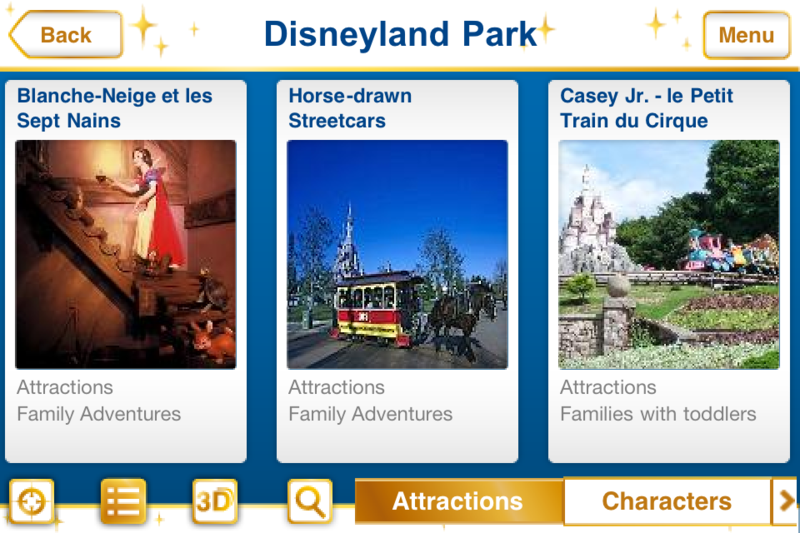 –	The interactive card: it allows you to highlight all the points of interest, such as shows, parades, restaurants, stores and services (ATMs, restrooms, etc) and to be geo-localized to make it easier to find your way around the parks. –	A search motor: symbolized by a magnifying glass on the map, it allows you to select the points of interest by criteria, be it the type of attractions (strong sensations, for little ones, etc) or even the specialties or prices of the restaurants. 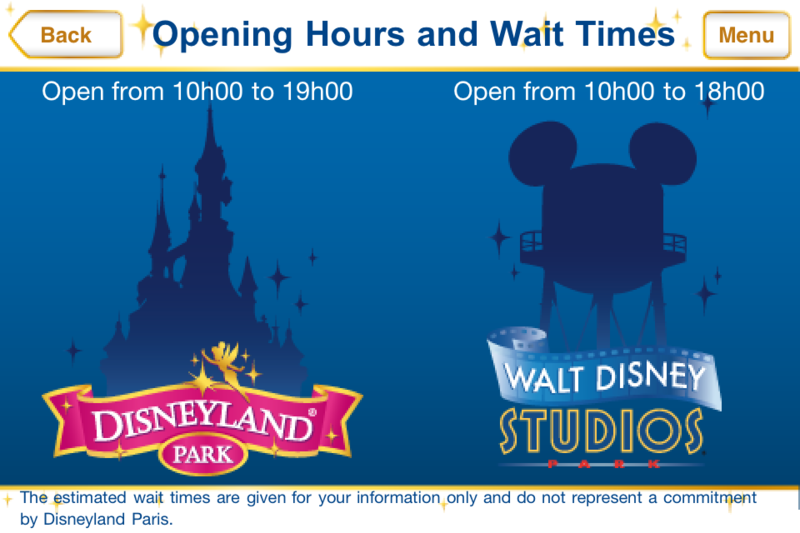 –	Park hours, attractions, shows and attraction waiting times are given when you are geo-localized in one of the parks. 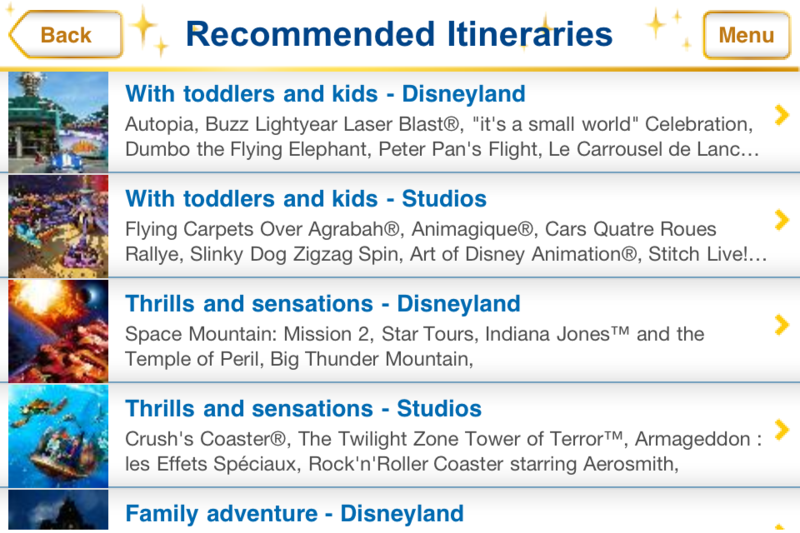 –	The schedule: it allows you to group together the attractions you do not wish to miss. A warning system is put into place and gives you the time of the shows you have reserved. This application is rich in content. We recommend you to download it via Wi-FI connection or to use your iTunes from a computer. The application is free. A wireless mobile connection is require to use it inside the Disney parks. Please consult the rates and fees of your operator before to use it. There aren’t many reviews in the U.S. version of the app store but, not surprisingly, there are many more reviews in the U.K. version of the app store, all glowing. The app is a fairly large download but once installed starts up quickly after the initial startup. 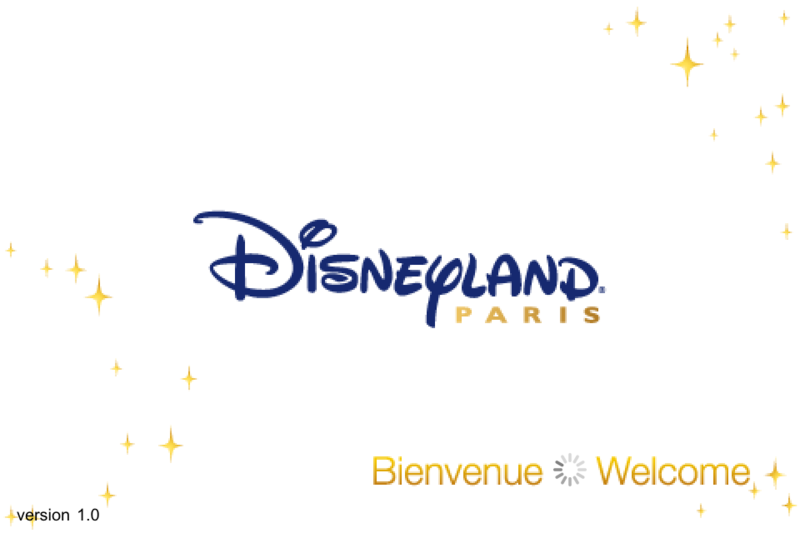 The first thing it displays is a “Bienvenue – Welcome” screen while it configures itself. It will pop up a requester asking if it can use your current location and another requester asking if you’d like push notifications to be sent to you. 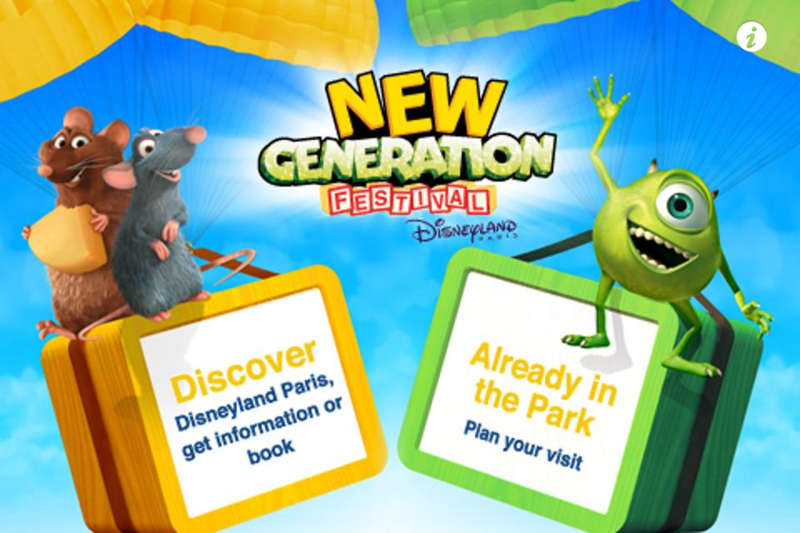 The app’s current theme highlights the New Generation Festival going on at the resort. 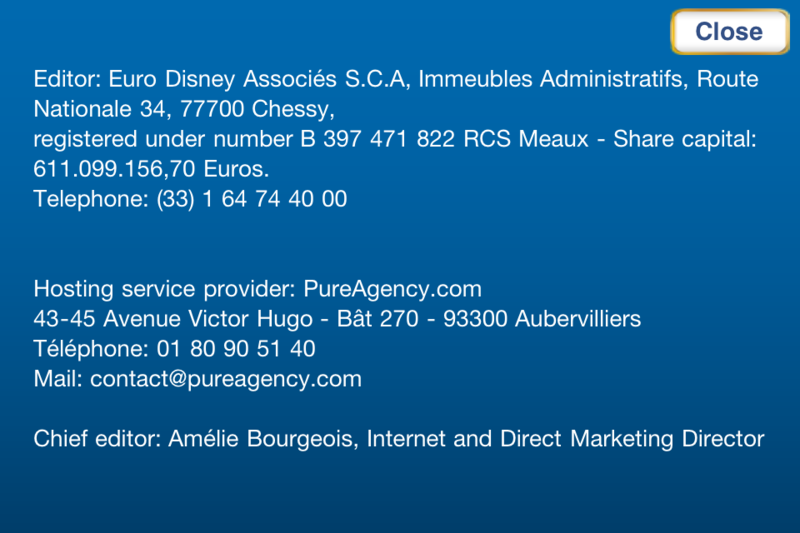 The Info screen shows that Disney used PureAgency to host the app. You are given many choices in the app’s extensive menu system. 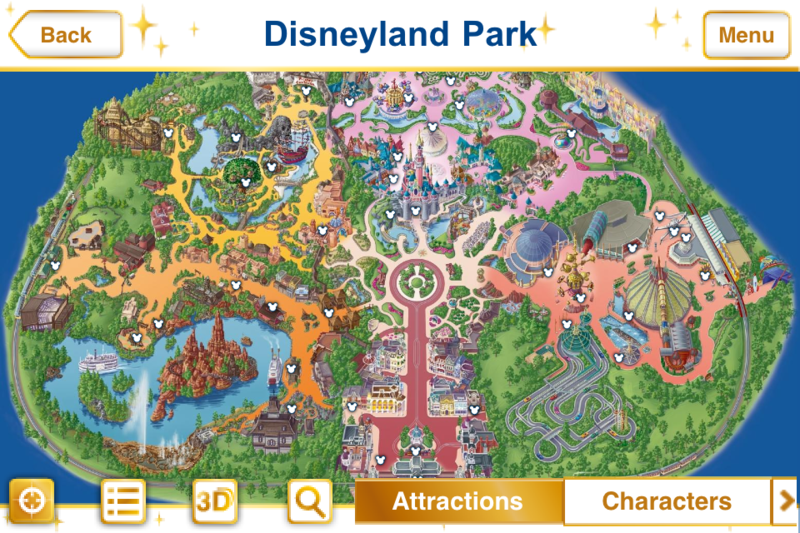 The maps show attractions, character meeting areas, shops, etc. You can zoom in and out just like you do when viewing your own pictures. 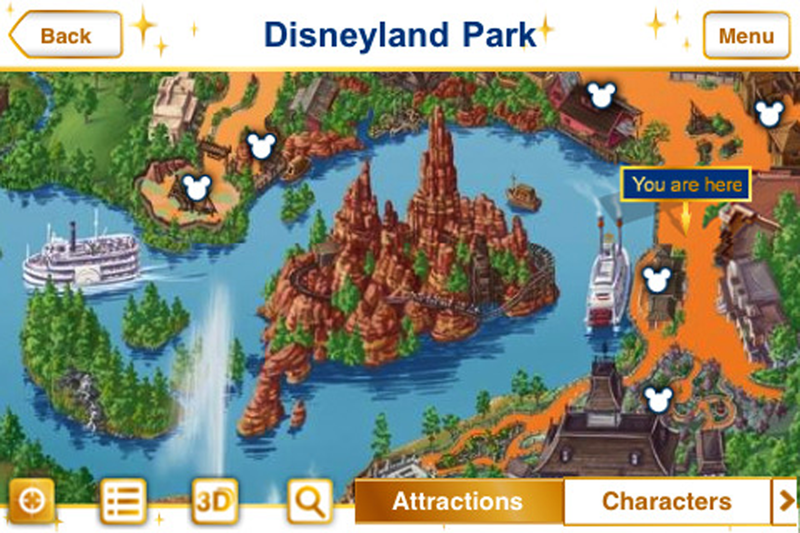 The maps will even show “You are here” (screen right, above) when you are in the parks and have allowed the app to use your current location. 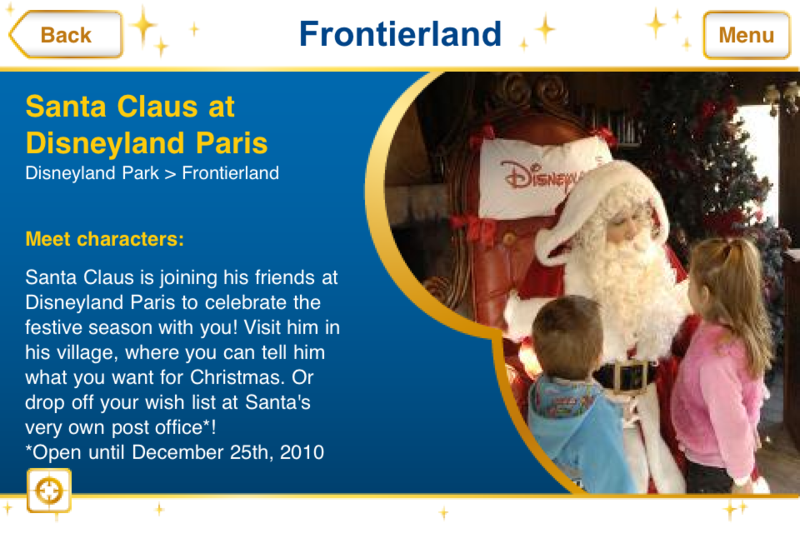 A lot of help is available in the app for finding and meeting your favorite Disney characters . . .
. . . and until December 25th you can even visit Santa Claus in his village in Frontierland. 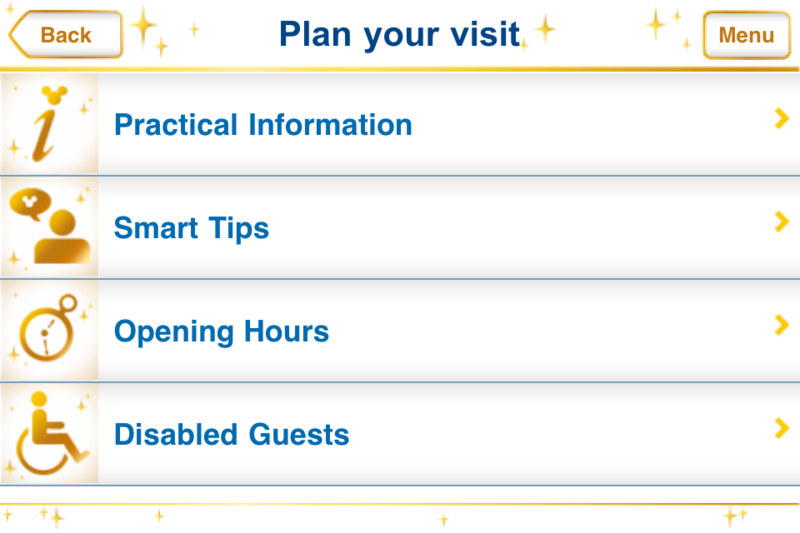 Planning your visit is a snap with the helpful information provided. 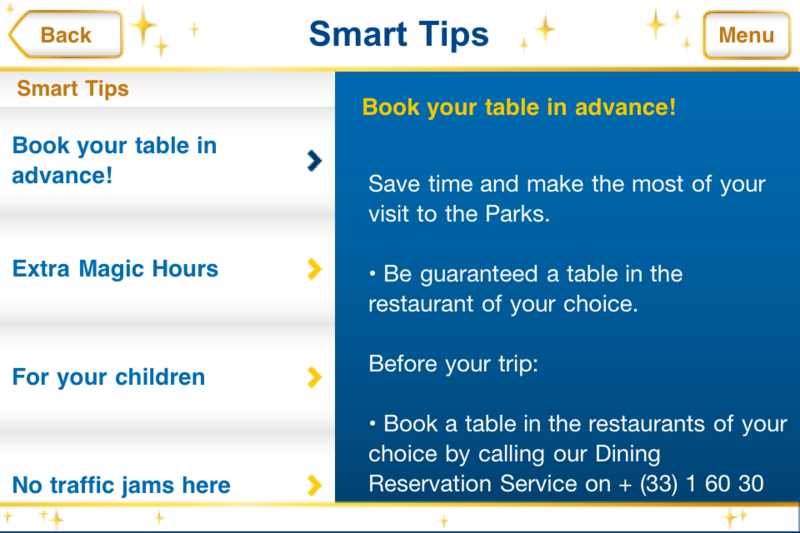 But it was hard to find a llsting of park restaurants in the app, except for the ones in Disney Village and the hotels, until I figured out that the > symbol next to Attractions and Characters meant to drag your finger from right to left along that line rather than touching the > symbol. 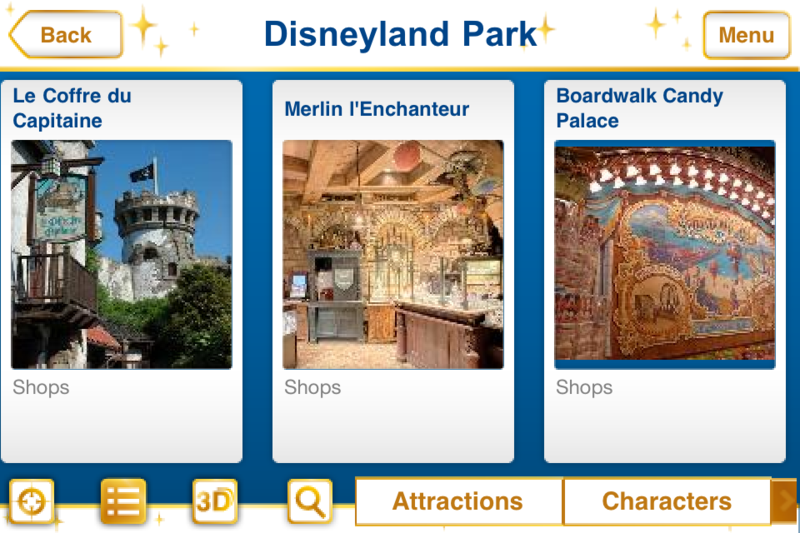 After dragging in that way in the parks section of the app, you’ll see other categories: Shops, Restaurants, Shows, Parades, and Services. 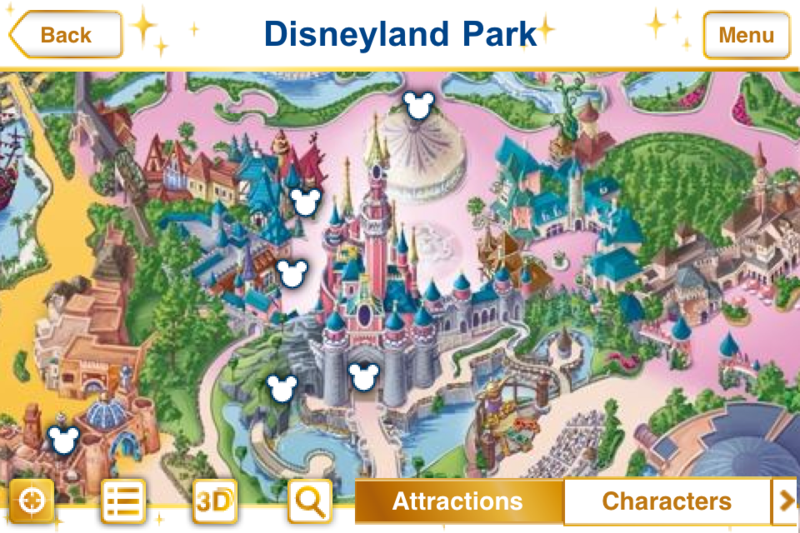 All can be displayed as Mickey-head icons on the Map view or in List view. 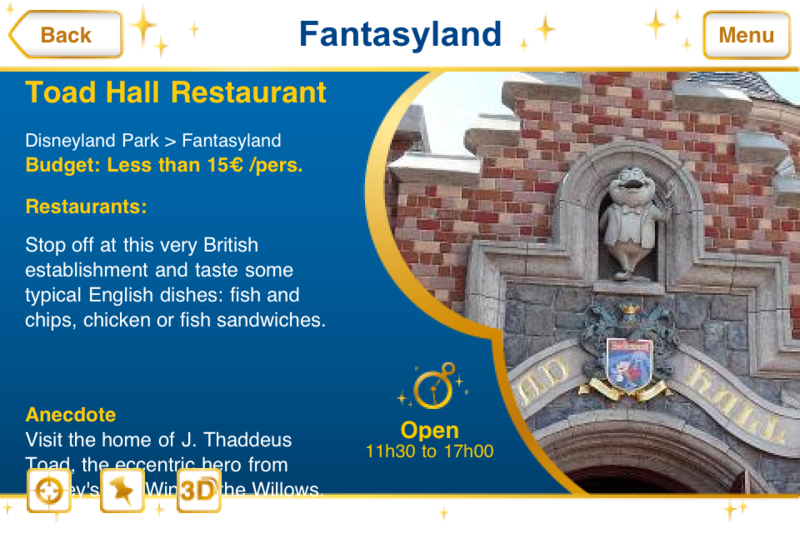 Even though you’ll be dining in France, frog legs are not on the menu in Toad Hall Restaurant. There’s a direct link to use your iPhone to call to book a restaurant reservation . . . but don’t call from the U.S. unless you want a huge phone bill! A variety of tips are given to help you make the most of your Disney vacation. Suggested itineraries are given for different groups of Guests visiting the resort. 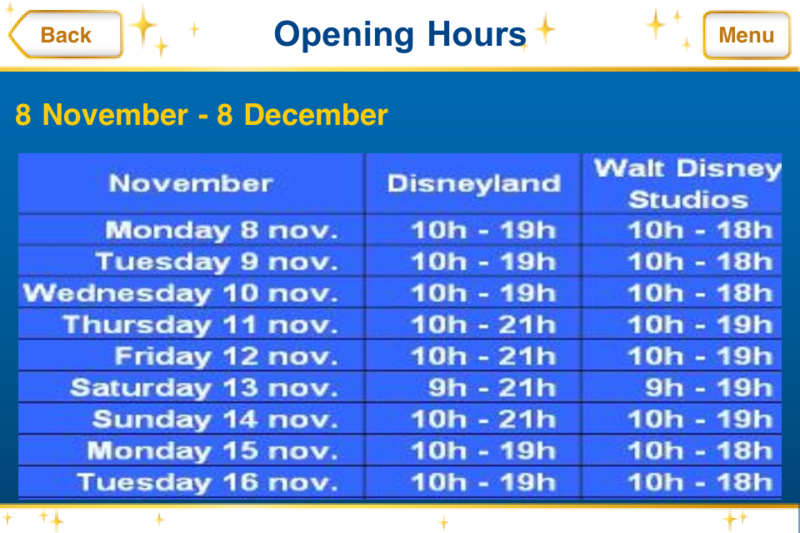 Find official opening and closing times for each day of your visit and wait times for the attractions. 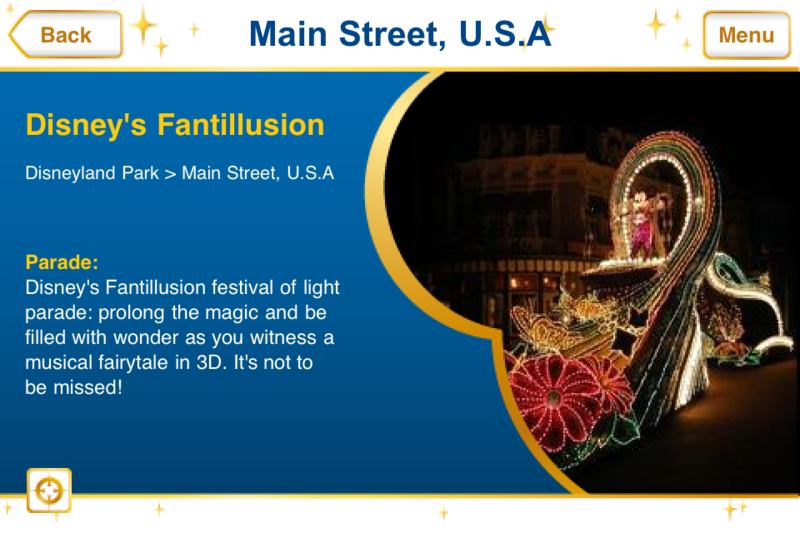 See colorful pictures and details about park attractions, shows, parades . . .
. . . and shops. 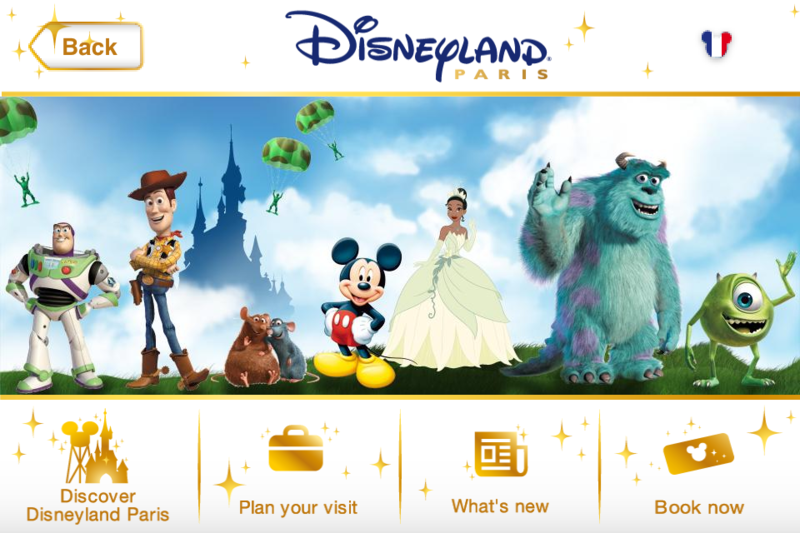 For more details about what went into creating this app, see News Parcs’ article with Nicolas Gougenheim, Operations Optimization Director, and with Thibaut De Saint Martin, Digital Marketing Manager Europe at Disneyland Paris. 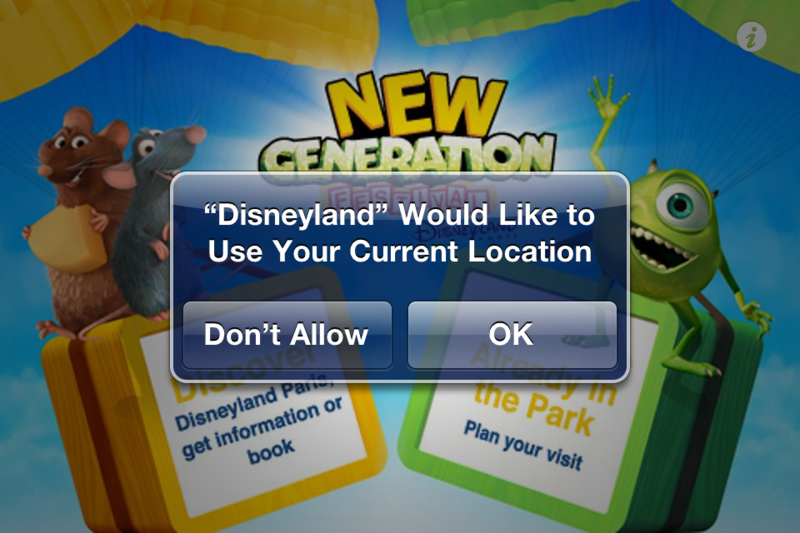 With a little faith, trust and pixie dust, let’s hope that Disney creates a great iPhone app like this for its California and Florida parks. Leave a comment with your thoughts! Download the app! What have you got to lose? It’s free! 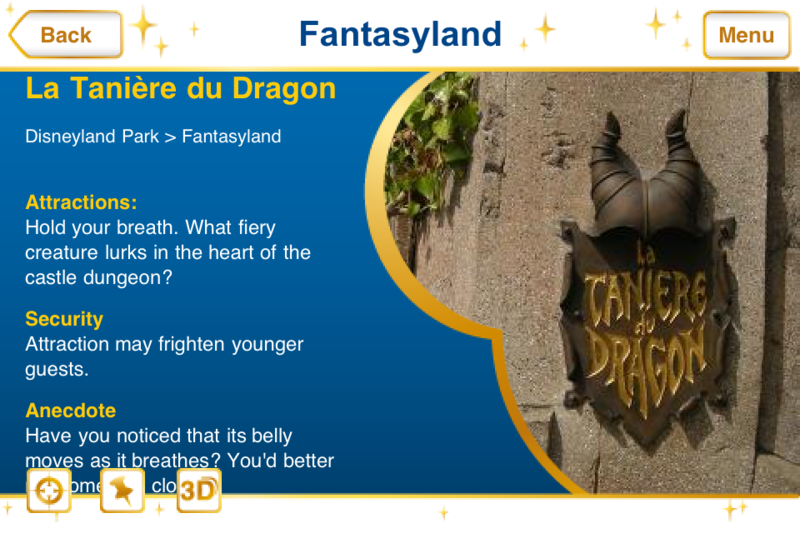 And who knows, the more people who download it, the more Disney might be convinced to improve it AND create a great app like this for the Disney parks in the U.S.